Works pretty well for the kind of lefties I like. 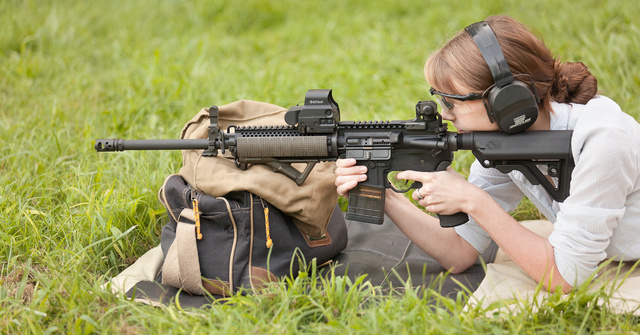 This entry was posted in rifle and tagged 223, AR15, girl, left hand. Bookmark the permalink. Dagger or bayonet? Regardless, I usually wear mine on the strong side. She can watch my back any time. Looks like an SAS-type dagger. 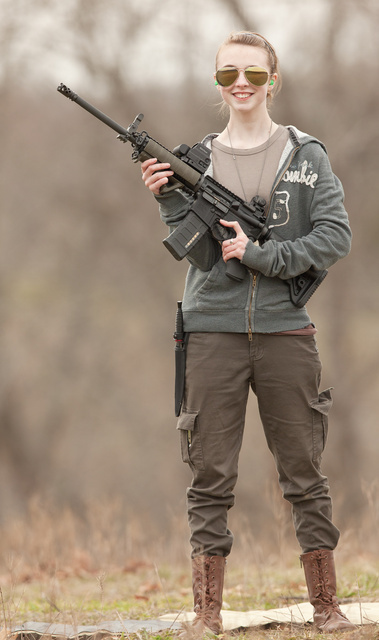 I see no facility for attaching a bayonet to the rifle, so that seems rather unlikely. While the front sight-post does appear to have a tiny little mini-rail underneath it, it is still way too far behind the end of the barrel for a bayonet to clear said barrel, and thus not of any use. It’s a reproduction WW2 Sykes-Fairburn dagger. Is the lady sporting a Sykes-Fairnbain at the waist? The boots, pants and knife kind of rechanneled a WWII Jedburgh… Was that by design or wishful thought. Still excellent format and composition. This is how Sarah dresses on a typical day. Wasn’t my idea. I think Sarah is not destined for typical days.